The Seattle City Council voted Monday to allow buildings as tall as seven stories on certain properties around the intersections of 23rd Avenue with East Union, East Cherry and South Jackson streets. 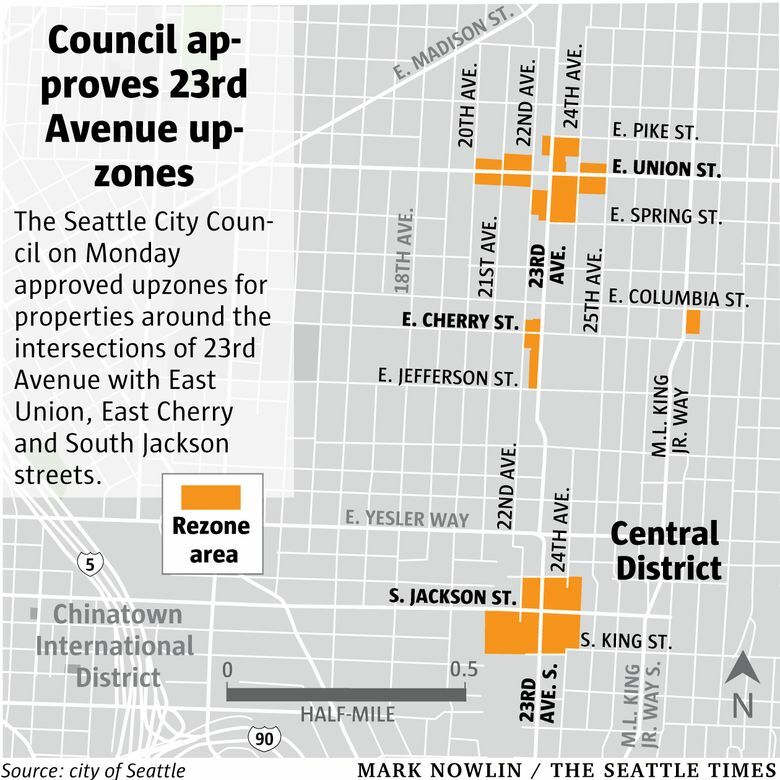 The Seattle City Council voted unanimously Monday to upzone three intersections along 23rd Avenue in the Central District. The changes will allow developers to build up to several stories higher on various properties around the intersections of 23rd Avenue with East Union, East Cherry and South Jackson streets. On certain properties, buildings as tall as seven stories will be allowed. The upzones also will trigger a new program requiring developers to help the city create affordable housing. Among the properties affected will be a 2.5-acre block at 23rd Avenue and East Union Street, where the MidTown Center strip mall is now located. A coalition of local developers and community groups closed a $23.3 million deal to buy the block in May and plans to build at least 520 apartments there. Development has ramped up in the Central District in recent years, welcomed in some respects but also viewed warily. The neighborhood’s demographics and culture have changed dramatically after decades as the heart of Seattle’s black community, with African Americans dropping from 70 percent of the Central District in the 1970s to less than 20 percent now. The new deal for the MidTown Center block has been hailed as a success of sorts in the battle against gentrification. The community group Africatown will own one-fifth of the block and develop at least 120 of the apartments, reserving them for lower-income households. Also among the properties covered by Monday’s upzones will be a 3.6-acre site at 23rd Avenue South and South Jackson Street, where the Promenade 23 shopping center and Red Apple Market are located. Paul Allen’s Vulcan Real Estate bought the site and parcels across the street for $30.9 million in 2016 and has been moving out small businesses ahead of building a mixed-use project with 530 apartments. The developer has said one-fifth of the apartments will be reserved for lower-income households. Vulcan plans to build up to 65 feet, a height already allowed. Construction is scheduled to begin in early 2018. Separately, Seattle’s new Mandatory Housing Affordability program is taking effect in neighborhoods across the city in tandem with upzones. It requires developers to include affordable housing in their projects or pay into a fund that the city uses to help nonprofits build affordable housing. The council earlier this year approved Mandatory Housing Affordability upzones for the University District and downtown and South Lake Union. It’s considering an upzone for the Chinatown International District and plans to consider upzones for dozens more neighborhoods next year. For the 23rd Avenue upzones, developers will need to devote 5 to 11 percent of their projects to affordable housing or pay $8 to $32.75 per square foot. The city estimates the East Union upzone will generate 22 affordable apartments — six of them built on-site by developers and 16 built using the fund. The East Cherry upzone will generate four affordable units — one of them built on-site, and the Jackson upzone will generate 26 units — seven built on-site. The estimates assume the housing will be affordable for households making no more than 60 percent of the area’s median income; this year, 60 percent of the area’s median income for a family of four is $57,600 per year. Along with the upzones, the council Monday passed a resolution that, among other things, recognizes a community plan for the neighborhood and states the city’s intent to work with community organizations on additional redevelopment projects. Seattle Times staff reporter Mike Rosenberg contributed to this report.